His first trip to Sunny Spain (1882-1885). After finishing his fourth year of Medical studies at the University of Santo Tomas, José Rizal was disgusted with the antique method of teaching in the Dominican University. He could no longer stand the racial prejudice of the Dominican professors against the Filipino students. With this in mind he decided to continue his studies in Spain. José Rizal left secretly the Philippines for Spain. He boarded the Salvadora (right) using a passport as Jose Mercado, which was procured for him by his uncle Antonio Rivera, father of Leonor Rivera. He was accompanied to the quay where the Salvadora was moored by his uncle Antonio, Vicente Gella, and Mateo Evangelista. 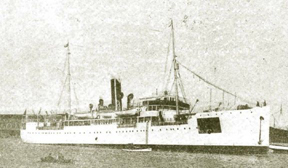 In Singapore, at 2 p.m., Rizal boarded the boat Djemnah (below) to continue his trip to Spain. He found the boat clean and well kept. Rizal arrived at Punta de Gales. At 7:30 a.m., he left Punta de Gales for Colombo. In the afternoon, Rizal arrived at Colombo and in the evening the trip was resumed. He landed at Aden at about 8:30 a.m. He made observation at the time. He arrived at the Suez Canal en route to Marseilles. 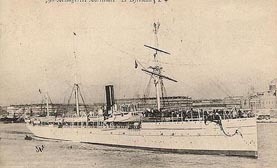 He was quarantined on board the Djemnah in the Suez Canal. Rizal arrived at Port Said. In a letter to his parents, He described his trip en route to Aden along the Suez Canal. Rizal disembarked and, accompanied by a guide, went around the City of Naples for one hour. This was the first European ground he set foot on. At ten o’clock in the evening, the boat anchored at Marseilles. He slept on board. Early on the morning he landed at Marseilles and boarded at the Hotel Noailles. Later he around for observation. He left Marseilles for Barcelona in an express train. At 12:00 noon, Rizal arrived at Barcelona and boarded in the Fonda De España. While he was living in Barcelona he received the sad news about the cholera that was ravaging Manila and the provinces. Many people died. In another letter Paciano advised his younger brother to finish his medical studies in Madrid.